Buhoma Lodge in Uganda is the ideal base for mountain gorilla tracking and a spectacular place to spend a few days on a Uganda safari. 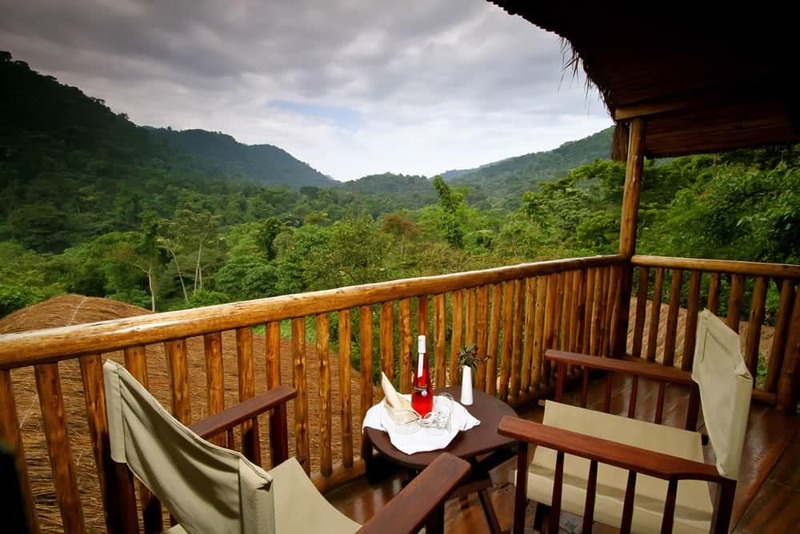 Located in the far south-western corner of Uganda, Buhoma is a top-quality lodge and one of only two lodges inside Bwindi Impenetrable Forest National Park, home to the endangered mountain gorilla. It’s a few hundred feet from the meeting point for gorilla tracking and other activities in the area. 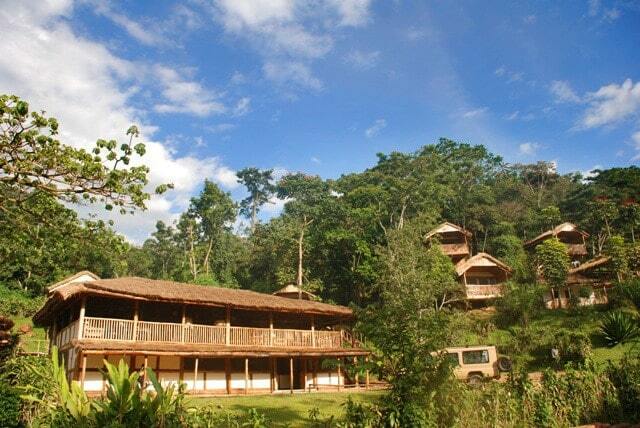 The lodge commands spectacular and uninterrupted views of the forest and mountains. The 10 chalets are spread out on the slope of a hill facing the park so you can enjoy sweeping vistas of the forest canopy from your private deck. Buhoma Lodge is renowned for its warm welcome and attentive service. This African-inspired lodge is eco-friendly, constructed with sustainable local materials where possible and using solar power. 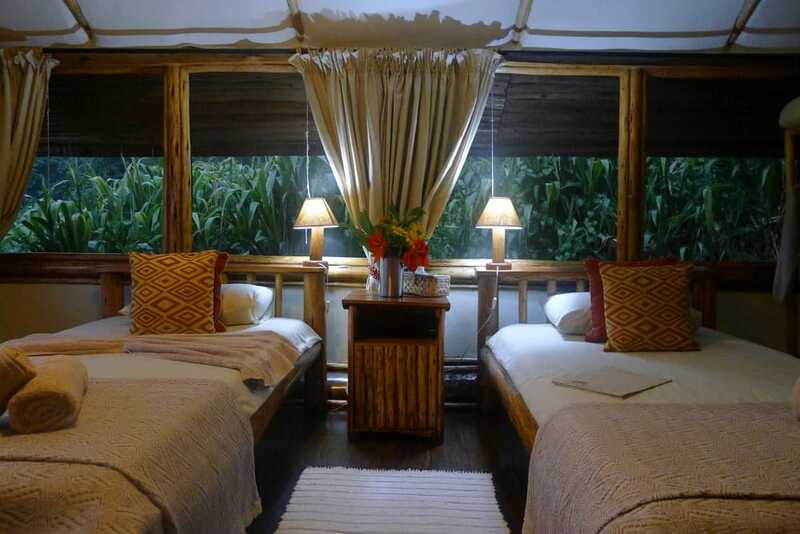 Each chalet has a private verandah and enormous windows, giving spectacular views of the rainforest. 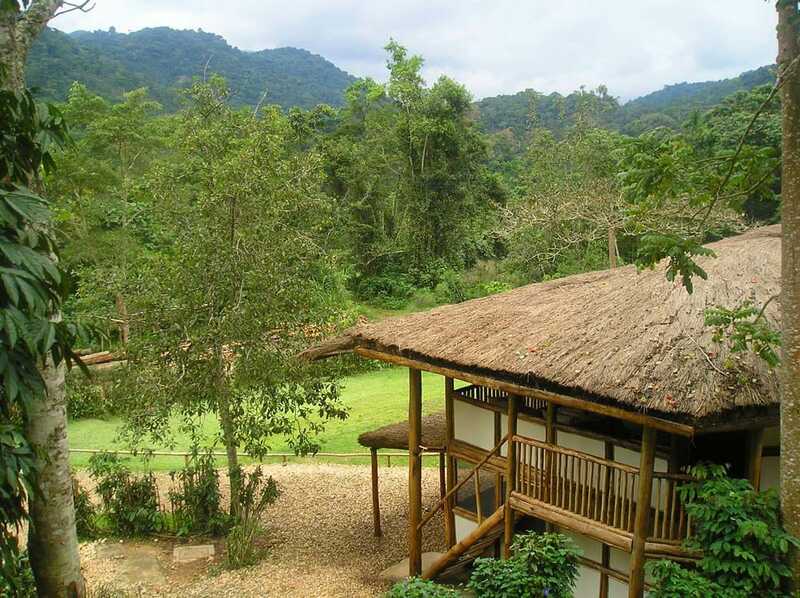 You’re surrounded by nature as you wake to chattering forest birds and the occasional screech of a monkey. Mountain gorillas have even been spotted in the garden! Inside the spacious chalets you will find large, comfortable beds and everything you need to make yourself at home. The well-appointed and roomy en-suite bathroom with flush toilet contains a shower with a copious supply of hot water and equipped with locally produced natural ranges of complementary bathroom amenities. Some chalets also offer a bath-tub for relaxation and enjoyment after the day’s activities. 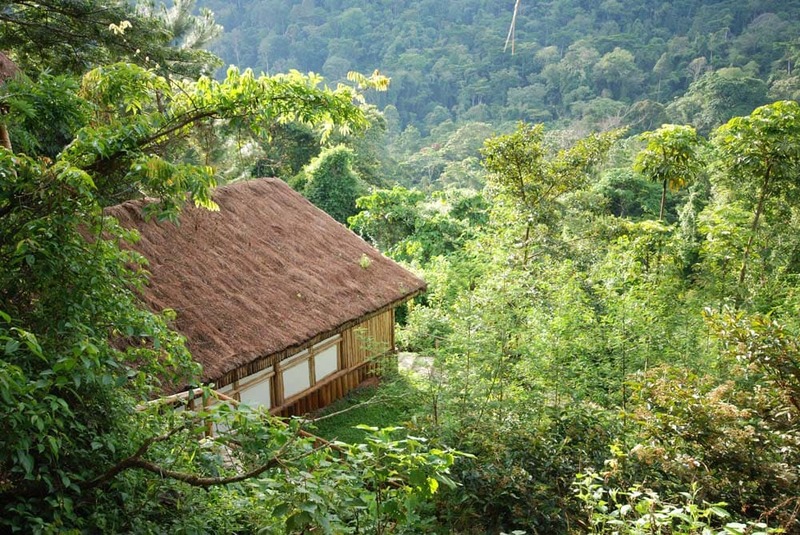 Each chalet is fitted with insect proof window screens, eco-friendly solar lighting, and a secure safe. The family / honeymoon chalet, in addition to all of the above, also features a separate lounge room with open fire place. The large, open-air lounge and bar area also offer uninterrupted views, whether the eerie mists envelope the forest or the views are crisp and clear, Buhoma offers its own special magic. 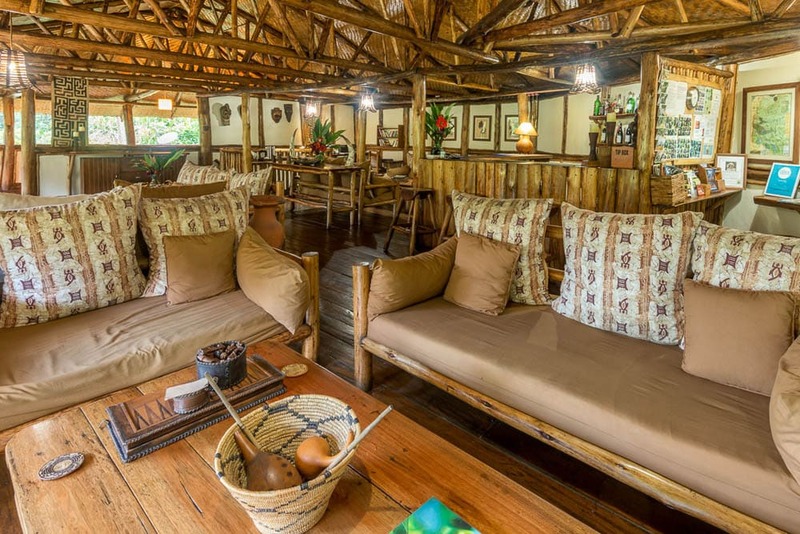 After a hard day tracking gorillas, relax around the open fire or enjoy a few drinks at the bar. Four course meals are freshly prepared from local produce and the bar has a selection of local and imported beverages. The friendly local staff will attend to your needs. Free WiFi internet and recharging facilities are available in the bar. It’s worth planning to spend a few days at Buhoma Lodge as there is lots to do in the area. Bwindi Impenetrable Forest’s mist-covered hills are blanketed by one of Uganda’s oldest rainforests and is home to about 400 rare mountain gorillas (roughly half of the world’s population). Gorilla tracking is the big draw here and hiking through the forest to spend time with a gorilla family should not be missed (see our Mountain Gorilla post for more details). However, there’s lots more to do. Bwindi Forest Walk - Embark on a walk through the tropical rainforest with experienced wildlife guides. Enjoy scenic views, the sights and sounds of the rain forest, ample opportunities for bird watching and glimpses of the many monkey species living in the park as they move through the forest canopy. Trails vary in length from 30 min to 8 hours. Bird Watching - Bwindi is one of the top 10 birding sites in Africa. This forest area has recorded over 350 bird species. Of particular interest are the 23 species endemic to the Albertine Rift and at least 14 recorded nowhere else in Uganda. Birding trips can be done around the lodge or in the Park with local qualified guides. Buhoma Community Village Walk - Join a community walk through the local villages surrounding Bwindi Impenetrable Forest. Optional activities include visits to a traditional home, local orphanage or school, banana brewing demonstrations and even meeting traditional medicinal healers. This three to four-hour walk is easily tailored to your individual schedule and interests. Batwa Cultural Experience - The Bwindi Impenetrable Forest is the ancestral home to the Batwa pygmies. These people were the original dwellers of the ancient forest and were known as the ‘keepers of the forest’. Spend day to see, understand and participate in the lifestyle of the Batwa when they lived in the forest and depended upon their hunting and gathering skills for their daily needs. Our Classic Uganda Safari includes a stay at Buhoma with gorilla tracking and other activities.